Mauritius: 9 Experiences to Take Your Breath Away, Literally! Romanticized as a honeymooning paradise by the turquoise blue waters of the Indian Ocean, Mauritius is a haven in disguise for lovers of a different kind; those that love the heady rush of adrenalin from being suspended in mid air, or coming face to face with the big cats of the ocean, or feeling the wind whirl your two wheel ride. Its location off the southeast coast of Africa and its unique geography with mountains in its interiors and serene waters along all its coastlines, make it a hotspot for adventures that aren’t for the faint hearted. My adventure map of Mauritius. Skydiving over the lagoon. Photo by Skydive Austral Mauritius. The thrill of skydiving will leave you high for days no matter where you try it, but Mauritius turns it up a notch, with a 10,000 feet dive over the turquoise and deep blue ocean. You free fall for 40 seconds, with the feeling that you’re floating in a bed of air, and it is the longest, most thrilling 40 seconds of your life. Then the parachute opens, and you fly like a bird in the wind for the next 5 minutes. Skydive Austral Mauritius is the only operator currently offering skydiving in Mauritius. A tandem skydive, including a 25 minute flight over a lagoon, will cost you MUR 11,500 (INR 20,000). Strong winds in Mauritius mean that a skydive might not always be possible (like unfortunately during my entire trip), so be prepared to move your dates and schedules around, especially in winter, from May to September. Kitesurfers in action on Mauritius’ east coast. 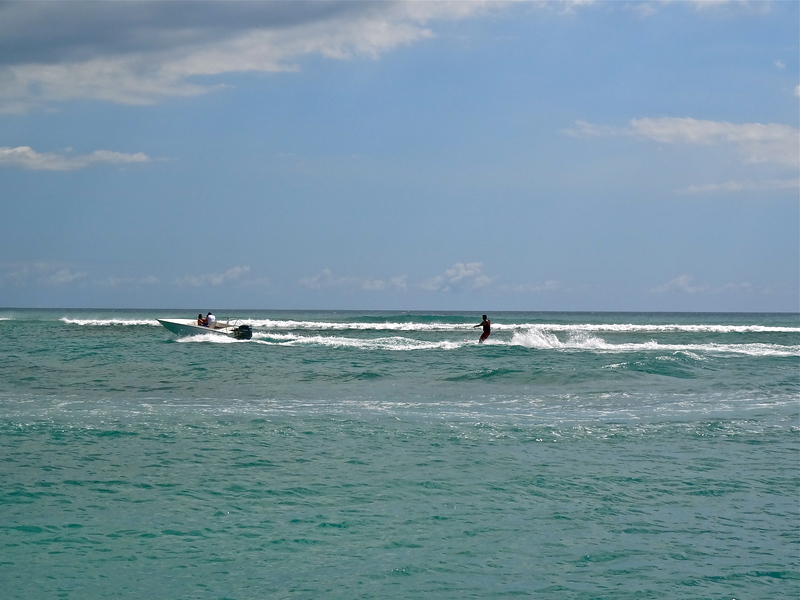 Kite-surfers are all the rage on the north and east coasts of Mauritius, especially over weekends. Watching them young things buckle up and take on the waves with such intensity could give you goosebumps; their boards swiftly maneuvering the waves, their chutes chasing the wind, and the occasional jumps into the air to land on their back in the ocean. 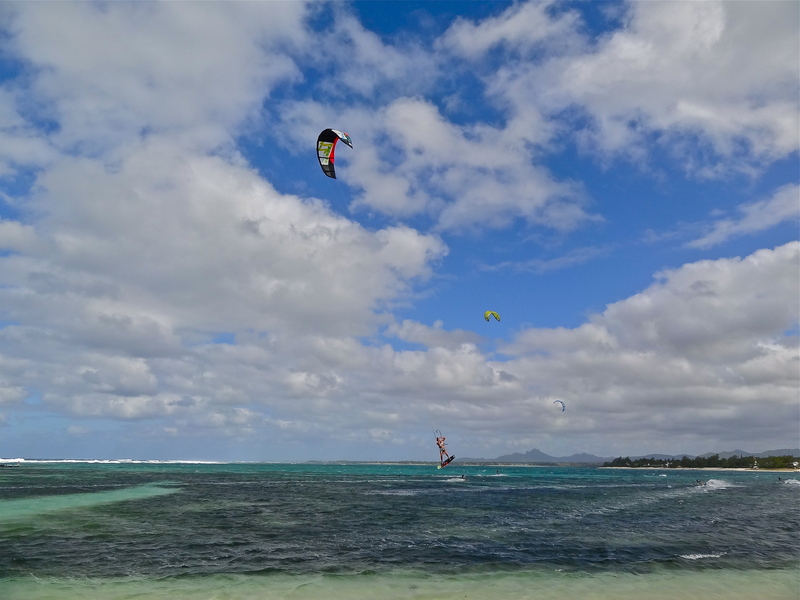 There are several kitesurfing schools along all the coastlines of Mauritius. A 2-hour lesson with Kite Globing will cost you 80 Euros (INR 6,000). Spotting these splendid creatures up-close. Photo by Dolswim. I met my first dolphin on the coast of the South China Sea, on a trip to Singapore in 2001, and instantly fell in love with their friendliness. Spinner and bottlenose dolphins show up on the west coast of Mauritius at the crack of dawn, after a night of hunting, graciously swimming in sync across the Indian Ocean. 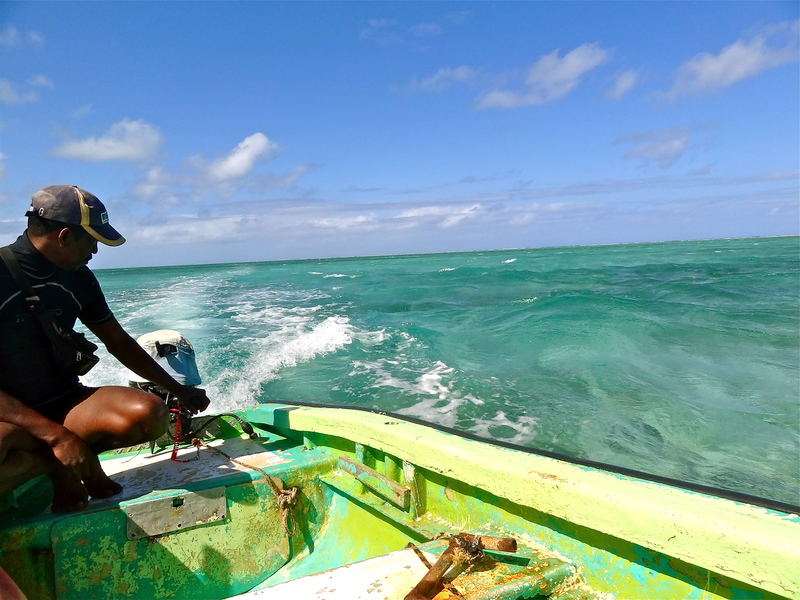 Dawn is identified as their socializing hour, and many boat operators in Mauritius can take you not just to see them, but to swim with them if you promise to do it gently. You could use a beautiful friend in the ocean, couldn’t you? As with any activities involving animals in their natural habitat, it is important to choose your operator wisely; one that respects the well-being and environment of the dolphins, as much as your safety. A recommended operator is Dolswim, who also promise a second ride free of charge, incase you don’t encounter any dolphins on the first. A 2 hour excursion with them will cost you MUR 1200 (INR 2200). 4. Whizzing around the ocean on a boat. What better place to let your hair down, put on your shades, and let the engine of your speed boat pulse your heart rate, than in the middle of nowhere in the Indian Ocean. Operator shacks in Trou d’Eau Douce in the east, will take you to the famous Ile Aux Cerfs island, while those at Mahebourg in the southeast, will take you to the endemic nature reserve that is Ile Aux Aigrettes. If whizzing on the open turquoise blue waters doesn’t take your breath away, the sparkling lagoons and jagged outlines will. Both island are roughly a 20-minute boat ride away from their starting points, and a full day excursion could cost you between MUR 1000-1500 (INR 1800-2700), including water activities and lunch. 5. Whizzing around the interiors on two wheels. 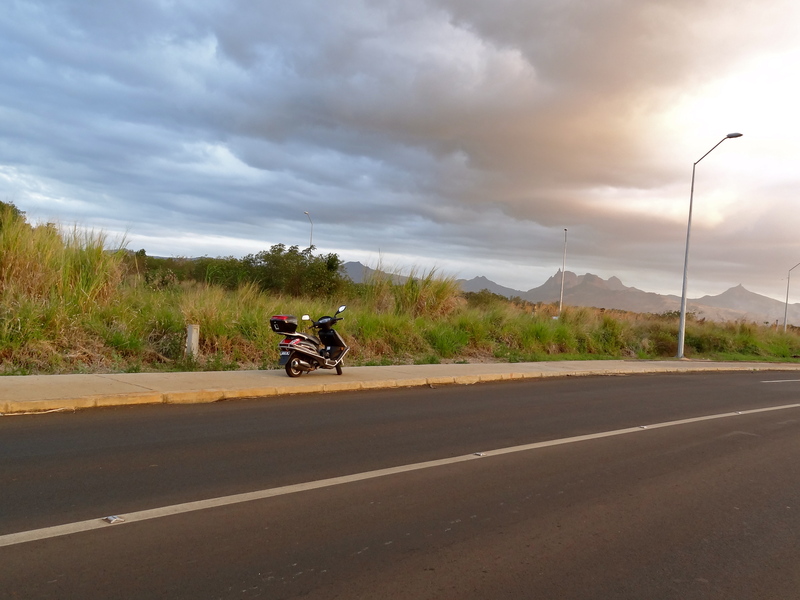 Never got enough of driving my scooter in Mauritius. The best way to shake all that sand in your shoes and salt water in your mouth, is to rent a two wheel on motors (a scooter), and whizz around the island, map or no map. Turn anywhere off the motorway, and you’ll find yourself surrounded by vast expanses of sugarcane fields. Look in your rear view mirror and you’ll see the mountains stand tall. Losen your grip on the accelerator and you’ll feel the wind taking control of your two wheels. Every motorist crossing you will give you a gentle nod, and you’ll think you belong right here, on the island. Scooter rental companies are fairly territorial, even on this tiny island. Most hotels and hosts have contacts of reliable operators and will arrange a scooter for you. If staying in the north, contact Kennedy at +230 9483 521, for good & reliable service. Rates vary and typically range between MUR 500-800 (INR 900-1400). Try negotiating if you’re renting for more than 3 days. An Indian driving license is valid in Mauritius. If you are like me and hate to have everything laid out for you on a platter (or a map) when you travel, staying a few days in Mauritius will make you wish you had arrived here a few decades ago. 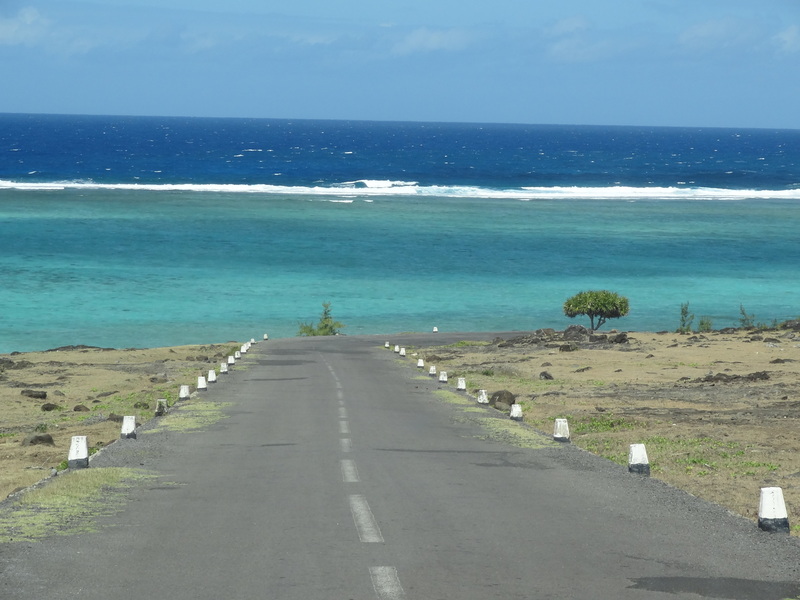 Shake off that feeling in Rodrigues, Mauritius’ lesser known cousin in the Indian Ocean. Landing on the blue lagoon of Rodrigues, with mountains jutting out on either end, on an airstrip so small that the pilot has to jerk the brakes really hard, you feel like a sailor who’s arrived on shores unknown. It won’t take long for you to fall in love with the shades of blue in its waters, the laid-back life on the island, its isolated paradisiacal bays with powdery beaches, and its little treasures that you’ll unexpectedly and inadvertently stumble upon. A return flight to Rodrigues from Mauritius will cost you around MUR 7000 (INR 15,000) on Air Mauritius, the only carrier that plies this route. Many families in Rodrigues offer home stays / guest houses in their own homes. For a budget stay, book yourself with Joanne at Le Case Creole, where a room would cost MUR 1200 (INR 2,200), inclusive of breakfast. For something more lavish, Cases a Gardenias with Marie-Line and Fernand is a great option, at 40 Euros (INR 2,800) per person, inclusive of breakfast. You’ll need to rent a car to see the island and unearth its treasures. 7. Snorkeling at Blue Bay. An evening at Blue Bay. While all of Mauritius is a mini paradise for snorkeling, Blue Bay, on the southeast coast of Mauritius, is exceptionally so. It is a protected reserve through and through, which means there is, and has been, no fishing in these waters. 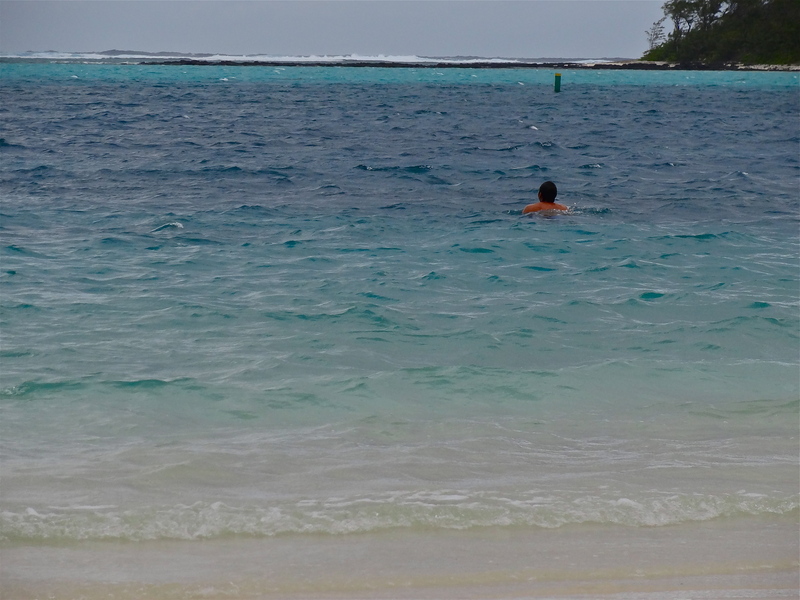 You can rent snorkeling gear and snorkel in the waters right from the beach. The further you go into the water, the more you are likely to find ‘aquarium spots’; stretches of water that are literally like an aquarium with corals and fish of all colors and sizes. Don’t let it take your breath away or you’ll be coughing with salt water in your mouth! Chez Pat is a cosy apartment a two minutes walk from Blue Bay, and Patrick, the owner, is an excellent host. A room will cost you 25 Euros (INR 1800) per person. Blue Bay is a 15 minute drive from the airport, so it makes practical sense to spend the first or last few days of your trip here. Water skiing in the bay at Le Meridien. If kitesurfing sounds a little too extreme, and snorkeling a little too tame, water skiing might be your thing; put on your skiis and waddle into the water, try to balance yourself, and clutch a rope tied to a boat. You’ll hear your heart race above the roar of the boat engine when it starts, and the instructions of sliding forward and slowly standing with your knees bent will gurgle in your head till you hit the sea and let go off the rope. The thrill doesn’t decrease with multiple tries, especially when you manage to survive a few more seconds each time. Half board accommodation in many hotels gives you access to complimentary water sports activities like water skiing. Psst… have you entered my ‘Dreaming of Mauritius‘ contest yet? The prize includes unlimited water skiing (besides a four nights stay for two people at Le Meridien Ile Maurice! 9. Zip lining over the ocean. Yours truly ziplining in Rodrigues. It might not sound like much when you compare a zip line to a 10,000 feet high skydive, but trust me, sitting on the edge of a rock, holding a thin rope close to your chest, and waiting to be pushed over a deep gorge, could bring your heart in your mouth. Once you’re pushed off that rock, flying over the valley with glimpses of the ocean beyond and the straight fall below is nothing less than exhilarating. Rodrigues has an excellent zip line, literally in the wild and the longest in the Indian Ocean, costing MUR 1000 (INR 1800). 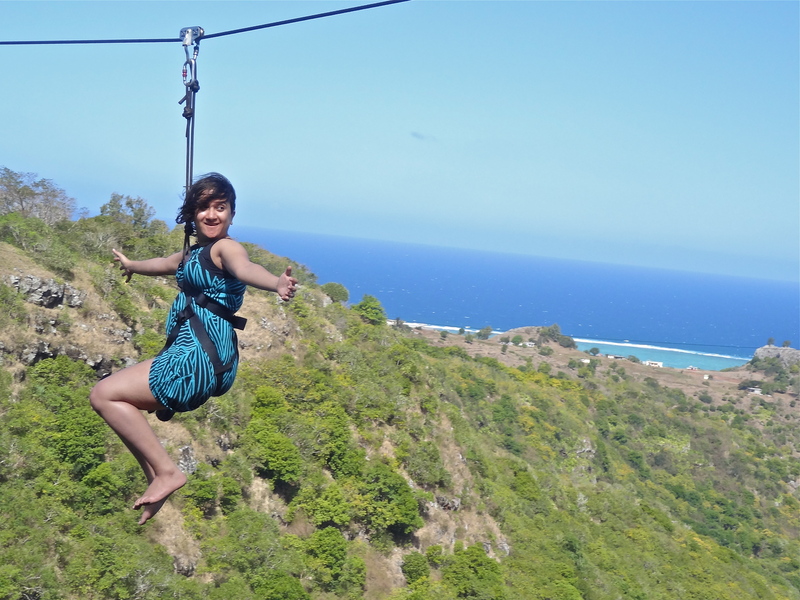 Mauritius has a relatively tamer zip line at Casela Nature Park, which costs MUR 900 (INR 1600), excluding the entry fee to the park, and can be upgraded to a full day affair. What adventures are on your bucket list for Mauritius, and which ones have you already done? Take part in my ‘Dreaming of Mauritius‘ contest and win a four nights stay for TWO at Le Meridien Ile Maurice, together with a ton of adventure activities like Water Skii, Glass Bottom Boat, Kayaks, Pedalos, Snorkelling, Windsurfing and Aquagym. Loved this post Shivya! You really made the best of your trip. Will be looking forward to some more of Mauritius through your eyes.. I admire you a lot ! Seems I wasted life all these years. Thanks Raji, never too late to get started 🙂 The world awaits! I’d love to go swimming with the dolphins and the water looks perfect for snorkeling. It’s too bad this place is so far away! Glad you love the map! Wow, I didn’t know there was ziplining at Jodhpur. Definitely going to check it out. Oh yes, 2 weeks would be just ideal, though after so much time, you end up leaving with such heartbreak. hello Shivya…..i m so much excited aftr reading ur experiences in mauratius… me n my wife planned a trip to mauratius during this december and ur blog helped me a lot to understand d activities in mauratius……thank u so much ….. Your posts really is exciting. Actually my would be Son in law is settled in Mauritius for a couple of years.My daughter definitely will be leaving for this beautiful island after marriage. Now I am getting this crazy idea of traveling to Mauritius & perform a marriage ceremony there itself. It would be an ideal place for a full week family get together. Your thought? Very informative and helpful post. Thank you it was a great help. People post everything except the costs incurred. It is affordable and a good budget trip that I am planning in may to Mauritius. Wanna explore these great places. Thanks once again. ha ha ..its amazing, verily i’m not exploring now but surely at some point in future. To explore on two wheeler is indeed my type of job. Previous PostDreaming of Mauritius Contest: Win a Stay at Le Meridien Ile Maurice! Next PostHow Travelling is Breaking My Heart.